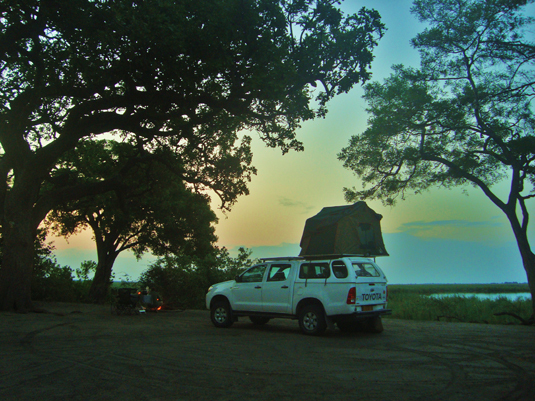 Our self-drive bush camping expedition continued into Botswana’s Chobe National Park. 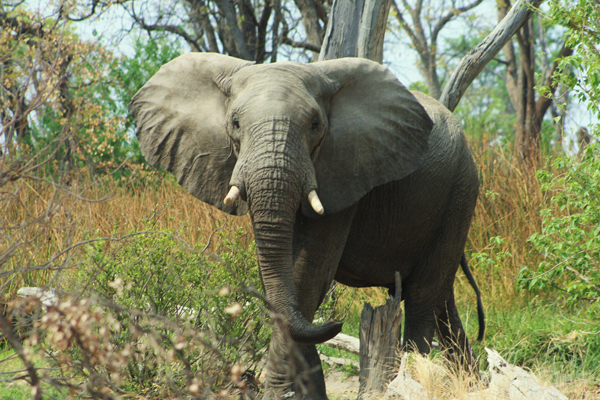 Located along the northeast tier of Botswana, the park is home to a great variety of wildlife and ecosystems. From the verdant forests and ample water supplies of the Chobe riverfront to the marshlands of Savute and lagoons of Linyanti, we’d spend the final days here of our Southern African safari soaking up the myriad of adventures on hand. Here are true tales from this Botswana journey. By the time we made it to Chobe, we were pretty well-versed in our safari routine. Up at sunrise to pack up our home (our trusty rooftop tent), we threw down a cup of instant coffee and brushed our teeth under the trickle of our water bottles. It was then time to hit those dusty roads for the sparkling blue waters of the Chobe riverfront. The morning game drive was a testament to what we’d already read. The area is home to some of Africa’s best game viewing and the density of wildlife is simply mind-boggling. We could hardly drive ten feet without some outstanding wildlife interaction. With each turn more elephants appeared in the horizon before parading down to the waterfront for an early-morning thirst quencher. The white-faced African Eagle stood guard on the tip-tops of trees and Lappet-Faced Vultures hovered overhead awaiting their turn to pounce. Herds of cantankerous zebras leapt inches from our car while statuesque kudus listened to our every word with their conch-shaped ears. Onto the carpet of green we found warthogs, gazelles, bushbucks and wildebeest with tails a waggin’ as they grazed peacefully aside massive Cape Buffalo. It was the greatest show on earth, the circle of life, all around us. And the grand finale? That was the leopard’s alone. Not one but two of the typically elusive leopards made a grand appearance in the final hour of our day at Chobe riverfront. Parking our car on the edge of the lush woodlands, we were about to get a lesson on the birds and the bees – feline-style. 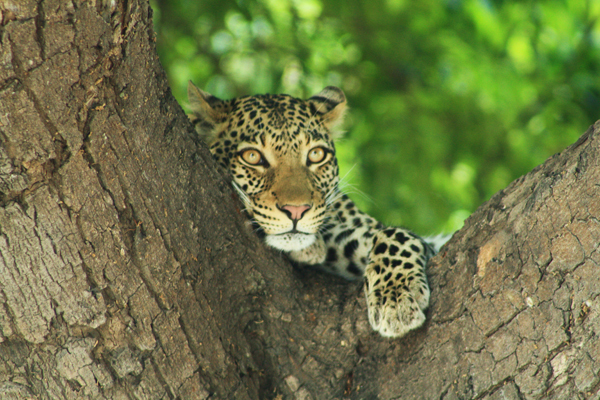 A male leopard encircling our car tried to catch the attention of his coy, female counterpart lounging on the sturdy branch of the sausage tree just feet above our car. Her ferocious hiss showed us who was in charge and informed us our birds and bees lesson was on hold, at least for now. 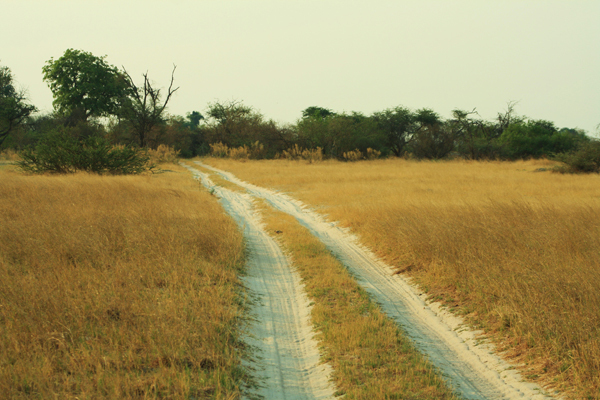 Moving on from the well-trodden safari path of the Chobe riverfront, we headed to the area known as Linyanti. For better and worse, Linyanti is way off the beaten track. Out in the middle of the bush in the secluded northwest section of Chobe, there is no other sign of life here but the elephants and hippos who inhabit the area. These are the kind of places that always attract us, but, in this case, we learned we should have come a bit more prepared. We arrived early afternoon to Linyanti to find the most pristine, unspoiled campsite in all of Southern Africa. We set up camp to the sound of baboons jumping overhead and warthogs snorting gleefully as they munched on the branches leftover from the elephants’ lunch. It wasn’t till late afternoon, however, when we realized these would be our only companions way out here in the bush. No other travelers had decided to brave the drive out to this remote area of the park so here we found ourselves miles away from any sign of human life. By night, it was thrilling. We were completely on our own. We built a massive fire and cooked a feast before settling up in our rooftop tent. Wrapped up like sausages in our sleeping bags, we fell asleep to the sound of splashing hippos feet away while gazing up at a sky twinkling with a trillion stars. But when we woke up, this was a different story. Twenty minutes into our drive back to civilization, we buried ourselves knee-deep in sand. We were out in the open, bait for the hundreds of animals lurking around with no choice but to dig ourselves out. Ryan spent all morning with shovel in hand while I was stood watch for approaching animals. As I mentally prepared myself for camping out in this area where we were told it might be days before another person might pass by to rescue us, Ryan’s new-found 4WD skills saved the day. We made it out of the sand, but this issue presented another problem. In trying to get ourselves out, we’d eaten up loads of gas and were running well on empty. But lo and behold, the angels of the bush must have been looking out for us. These angels came in the form of a caravan of boisterous and well-prepared South Africans with enough extra diesel to fuel a jetliner. No phone, no GPS and rarely a sign of human life, we were quite naïve being way out here on our own. In Linyanti, it was clear we’d used up our nine lives. It was time for the flat expanse of the park known as Savute. The scorching sun of the desert landscape and dead trees providing a limited amount of shade usually transform this place into a thirst-land for animals scrounging for water. We had high hopes of big game sightings in Savute, but instead what we got was a big storm and a surprise reunion with friends from the road. 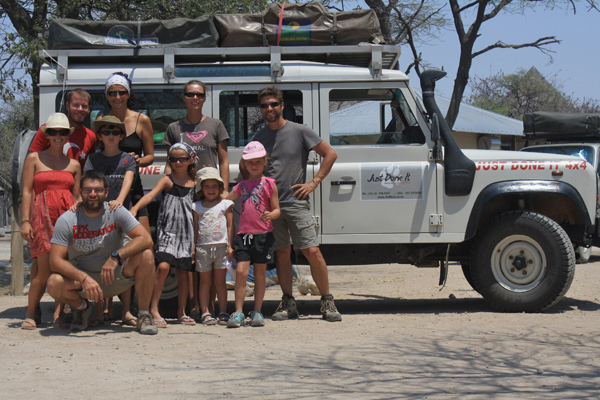 We’d met two French families during our journey through Namibia. We bonded quickly after learning they too were on similar year-long around the world trips (theirs with kids!). Because misery loves company, our mutual vehicle woes did even more to solidify the bond. We spent the day with our Frenchie pals rehashing bush tales around camp, only interrupted by elephants traipsing around our tents and the afternoon sun colliding with heavy rains. Hiding from the rain on the tailgate of our car, we paid homage to our hometown on this Halloween night over cans of the classic Botswana brew, St. Louis Lager. Then it was time for one last rendezvous with our travel pals with burgers and baked beans cooked over a roaring fire. While this day was nearly devoid of game sightings, sharing this night with our Parisian friends was special in and of itself. Quitting our jobs to travel the world had many of our pals back home wondering if we might have a screw loose. It’s so refreshing on the road meeting people like this…who share the same thirst for adventure, who are looking for more out of life than the that nine to five gig and who are willing to take the risk to find it. Out here in the middle of the African bush, we watched our new pals share these transformative experiences with their kids. And, well, it makes us pretty certain this isn’t the last time we embark on this sort of journey. Well, good thing you keep a man around Laurita, I’d like to see us dig a 4WD truck out of the sand together. So its good to know in 15 years, we could be those couples traveling with our kids around the world! xo – The pics are amazing, and I never tire of reading your adventures! Thank you so much for your reply, there is a mention in your text that you’ll detail the horror story about the rental. My kids will be 17,15 and 12 by that time, we’ll do our homework. Thank you for the link. Welcome home! @Shivya – Thanks for the kind words on our photos and blog and sorry you found us at the tail end of our journey. Hoping to share more from the last leg of our travels in Africa soon! 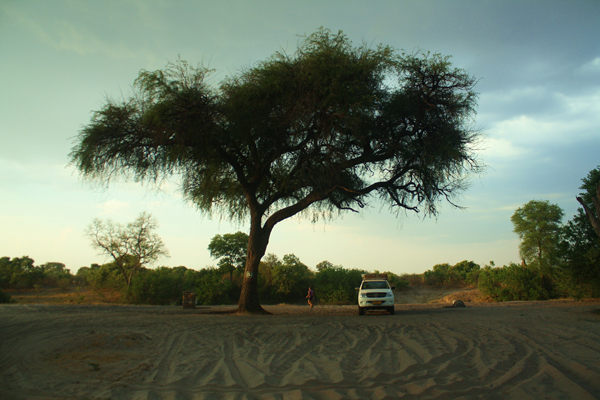 @Mihai – Can’t recommend enough the self-drive travel through Southern Africa. It’s an adventure of a lifetime and to experience it with kids is a dream of ours! Depending on the ages of the kids, the Land Rover option may still work for you, but our French pals would probably be able to offer much better insight. Here is their blog to reach out for more details: http://www.visiterlemonde.net. Lastly, we rented (as did our French friends) with a company called Just Done It out of Cape Town, SA. DO NOT rent with this company, whatever you do! We have horror stories to share from this rental choice. Definitely do your research to find a reliable option and please let us know if we can be of any help with your upcoming travel plans! Wow, your blog and your pictures are both amazing! Too bad I stumbled on it only when you’re homeward bound. I’ll be back to read your travelogues in detail again Rolling you! Laura, I enjoy reading about your travels and congratulate both of you for this great blog and the nice pictures. Do your French friends have a website? I have three kids and I am wondering how they got there and what arrangements did they make, because we are probably not gonna fit into a car like yours. Or would we?